In a large cooking pot, heat the water to boiling. While the water is heating, wash and peel the onions, carrots, and garlic. Dice or chop the onions, shred the carrots and crush the garlic. Add to the cooking pot. 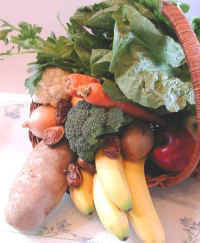 If you are using other fresh vegetables, wash and prepare them, and add to the cooking pot. Add the rest of the ingredients and bring to a boil; then reduce the heat to simmer. Stir approximately every ten minutes. 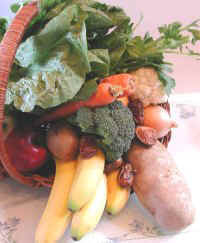 The stew is ready when the veggies are tender. Total cooking time is approximately 45 minutes. 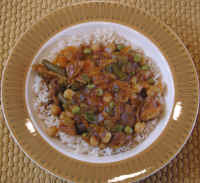 This stew may be served over brown basmati rice (as in photo) or "as is."